The St Andrews Church Choir led the singing on Sunday 31 July at the service to bless Golspie Gala Week, which started that weekend. The choir has begun to regard this as a regular feature in their annual timetable and we were all pleased to note how the attendance at the service has steadily grown since our first appearance several years back, with a wide variety of locals and holiday-makers attending. A pattern of requests for favourite hymns interspersed with choir numbers has now become well-established. 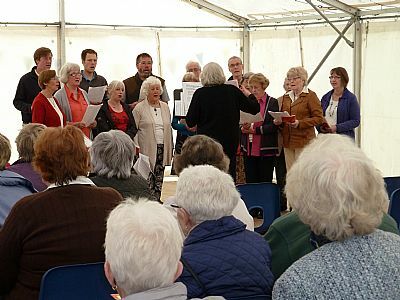 JUNE 2016 - St Andrew's Church choir is now well into its sixth year in existence and continues to develop and expand its repertoire, despite quite an ebb and flow in membership. Our main performance so far this year was the Easter Service when we sang one new song from the musical “Rock” and also, “This Joyful Eastertide”. We have just begun practices again for Communion in June and we hope to sing at the Gala Week service again this year. After a short break, we may sing again at the Guild annual service and also hope to revive and add to the range of songs and carols we can perform both at the Choir's Christmas Service and in our Carol Singing, out and about around Golspie. Over our six years in existence we have developed quite a large repertoire which we want to keep alive as well as learning some new pieces. We meet every week on a Tuesday from 8.00 till 9.00, usually in Fountain Road Church Hall. Anyone wishing to try their hand at singing would be made very welcome because the inevitable life changes mentioned above have meant that we have lost more members than we have gained recently. We were formed to be an "occasional" choir which means, by and large, that we need to have a fairly large pool of singers to call upon when an "occasion" arises because work, holidays and other commitments mean that not all can be available for any one event but, if there are sufficient in the pool, a workable group can always be got together. OCTOBER 2013 - St Andrew's church choir is now well into its third year in existence and continues to develop and expand its repertoire, despite quite an ebb and flow in membership. Our highlight so far this year was probably the Gala Week service when we sang a selection of spirituals and Gospel songs with accompanying instrumentals given by Dorin on his saxophone. This seemed to be greatly enjoyed by one and all. We have just begun practices again after a summer break and are currently working on two hymns to sing at a Guild Service in November and also on increasing the range of songs and carols we can perform both at the Choir's Christmas Service and in our Carol Singing, out and about around Golspie. We also hope to keep alive some of our past efforts and to learn some new hymns and Scottish songs to be available, when appropriate, in the coming year. We meet every week from 8.00 till 9.00, usually in Fountain Road Church Hall. Anyone wishing to try their hand at singing would be made very welcome. We were formed to be an "occasional" choir which means that, by and large, we need to have a fairly large pool of singers to call upon when an "occasion" arises because work, holidays and other commitments mean that not all can be available for any one event but, if there are sufficient in the pool, a workable group can always be got together. A Communion Service with the Choir was held on Sunday 7 July at 11:00am in St Andrew’s Church. An Easter Communion Service with the Choir was held on Sunday 31 March at 11:00am in St Andrew’s Church. Sunday 16 December 2012 - Christmas Choir Service: - St Andrew’s Choir sang at the morning service on Sunday, 16 December in St Andrew’s Church. Choir and congregation of St Andrews Golspie (over 100 strong) in the old church sing 'Guide Me Oh Thy Great Jehovah' at the Re-Dedication of the Church after it was damaged by flooding in 2011. The choir practices on a Tuesday evening at 8 o'clock in Fountain Road Hall and sometimes after Church on Sunday mornings. Please come and join in if you would like to make a joyful noise. Bea Mackay and our pianist Maggie McQuillan help us all to learn our parts. On Sunday the 7th August the St Andrew's Choir took part in morning worship, and if the congregation enjoyed their singing as much as the choir did it was indeed successful. The Call to Worship was the choral piece "Jesus stand among us". Later the choir lead the congregation in Psalm 95 to the tune Bon Accord. The Psalm "O send thy light forth and thy truth." to the tune Invocation was the Anthem sung after the Offering.